This composite photo shows meteors of the Lyrid meteor shower over New Mexico in April 2012. Photo courtesy NASA, Marshall Space Flight Center, photo by Danielle Moser. 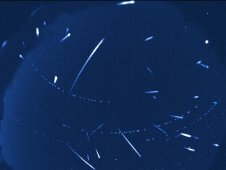 Skywatchers will have the chance next week to see the first obvious meteor shower of the year as the Lyrids reach peak visibility. The show will take place on the night of April 22 and early in the morning on April 23. The crescent moon on that night will set around midnight, local time, leaving the possibility of a relatively dark night sky in which to see the meteors. Meteor showers occur as Earth, as it moves through its orbit, passes through debris left behind by comets. The Lyrid meteor shower is the product of Comet Thatcher (C/1861 G1). According to a website maintained by NASA’s Jet Propulsion Laboratory at the California Institute of Technology, Comet Thatcher has a period – the time it takes to orbit the sun – of about 415 years. This year’s April encounter with Comet Thatcher’s remnants will occur between April 16-25 as the meteors move at a velocity of about 110,000 miles per hour. The Lyrid meteor shower, like all meteor showers, gets its name from the constellation from which its radiant appears to originate. The constellation Lyra (the harp) is most obvious in the northern hemisphere during the summer months, but it can be seen in spring lower in the sky. The constellation’s brightest star, Vega, is about 25 light years away. It is the second-brightest object in the northern hemisphere’s night sky.